Batman v Superman: Dawn of Justice, in theaters March 25, marks the first big-screen face-off between the superheroes. 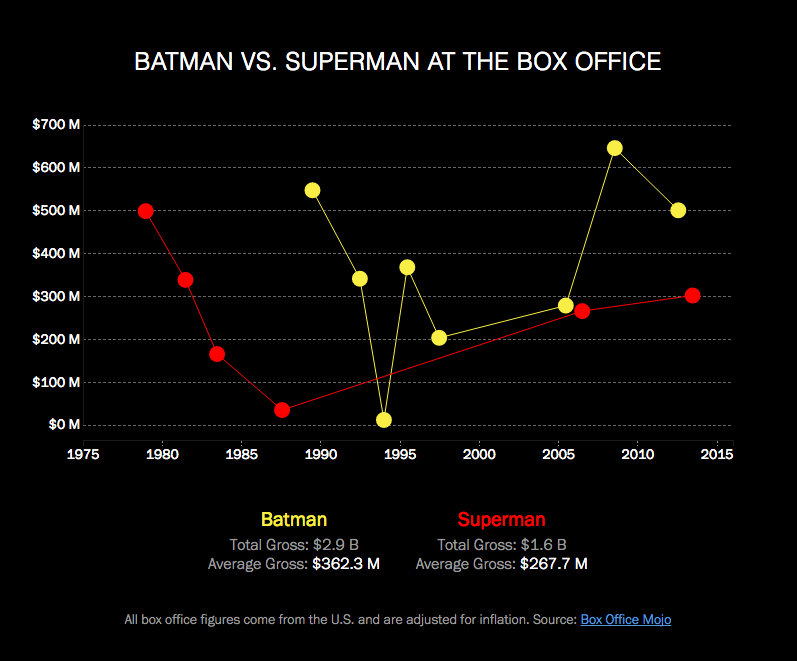 But a closer look at ticket sales shows there’s already a winner: the Caped Crusader. The eight Batman theatrical releases brought in an average of $362 million, compared to the nearly $268 million average haul from the six Superman films. The most successful Batman film ever is 2012’s The Dark Knight, starring Christian Bale as the Bat, with $646 million. The Man of Steel came closest behind in 1978, with Christopher Reeves’ Superman, raking in $499 million, adjusted for inflation. The only question that remains—beyond who will win Dawn of Justice‘s superhero showdown—is whether Will Arnett’s Lego Batman can keep up. Hover over circles in the graph below to see details for each movie.